If you are looking for some girly cocktails to get you in the mood for the movie that is coming out today, you are in the wrong place. I am not going to feature something in a martini glass just because that movie made a it an accessory (and fad). Today, I am going to share with you, my loyal reader, some classic cocktail recipes. These drinks put the c*ck, back in cocktails - they are strong and not to be consumed by amature drinkers. The true definition of a “classic cocktail” means that it appeared on menus before the end of Prohibition (1934). The recipes I included below may not be “classic” by definition, but they are all official cocktails of the International Bartenders Association (or IBA if you will). Old FashionedPossibly the first drink to be called a cocktail, this is served in guess what…an Old Fashioned glass. This drink dates back to one of the original six drinks listed in David A. Embury’s book "The Fine Art of Mixing Drinks." The Manhattan dates back to the 1870’s to the Manhattan Club in where else – New York City. It was said to been invented for a banquet hosted by Jennie Jerome, aka Winston Churchill’s mom) in honor of presidential candidate Samuel J. Tilden. 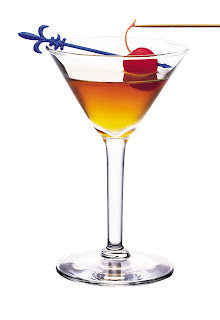 Today, the drink has been called the “king of cocktails,” because it is a drinking man’s cocktail – strong, urbane and simple. Stir with ice, strain into a cocktail glass, twist lemon peel over the top and serve garnished with an olive, preferably one stuffed with any kind of nut. One thing that I can agree with Embury on is that “..the drink will never be any better than the quality of the cheapest ingredient in it.” That means don’t use Vladimir Vodka.